Save time and create more efficiency for yourself and your customer with a distribution kit from Kavo Parts you have everything at hand. Replacing a timing belt is a time-consuming and costly job. If the timing belt needs to be replaced, it is wise to also replace all other parts of the system. Apart from the tensioner pulleys and tensioners, this also applies for the water pump. If the water pump is not replaced, it will suffer severely. The water pump, itself also subject to wear and tear, will have to be replaced at a given moment while the timing belt is still good. The timing belt and all parts will have to be disassembled again. A disassembled timing belt may never be mounted for a second time. This time-consuming job will thus increase costs for your customer! We therefore strongly recommend to replace the water pump immediately. 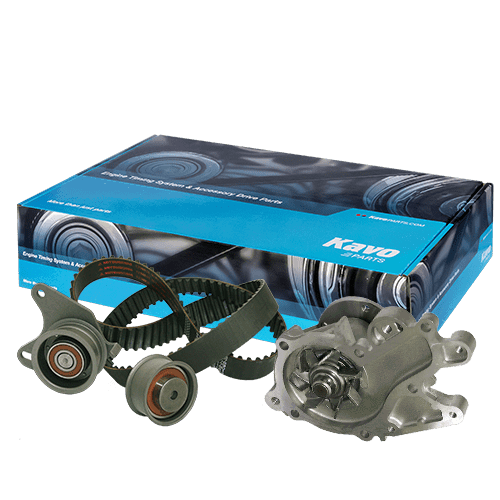 That is why, in addition to the standard timing belt kits, we also have water pump kits for Japanese and Korean cars. You have all the parts in a single box.